I've watched this movie many times, it is among one of my very favorites. The scene opens up on a woman's wedding day. There she is in her gown looking up into the eyes of her father as they share a dance. They are both content to dance silently for a few moments before the father asks, "So have you thought yet about the things we will no longer do regularly together?" Before the daughter has had much of a chance to answer he catalogs his own list. "I've thought about how we will no longer watch 'our show' together on Thursday nights. Who will go eat pizza with me every Tuesday? The sign language we made up to talk to each other..."
The list goes on. The daughter begins to have flash backs as the father is speaking. Valentines day at the beginning of that year, the last one her father would perform his duty in his single daughter's life. Flowers and a card, a gift, or in this instance a lunch date. Filling a void that he knew would one day be filled by a husband but today he was happy to be that man. She recalled many, many times of laughter shared over the years, moments of shared wisdom and advice. Sweet and patient correction over the years as it was needed. The bride, now with tears in her eyes, smiles. Her mind races back further to moments she experienced but was too young at the time to remember firsthand. She relies on stories told to her over the years. She was born so tiny that she required extra attention. He father awoke every few hours to place hot water bottles in his infant daughter's bed because she was too tiny to maintain her own body heat. Just days earlier in a hospital room the mother and father had been given a grim report. The child may not make it. And if by some miracle she did it would be to exist in a vegetative state. Broken by this news the father returned to the hotel room he occupied during mother and babies' stay in the hospital. He wept and prayed for the life of his child. He had always trusted God and His sovereignty and this time would be no different. Opening his bible in that darkened room. He read the words. "God gave Sarah strength." Sarah, the name they had given their little girl had come with a promise, a promise of strength. Renewed with strength of his own he returned to the hospital to share the news with his wife. Their trust never wavered from that moment on as over the next few years doctor's reports continued to be negative. He had prayed for his daughter and trusted in a promise with love. This movie plays only in my head. 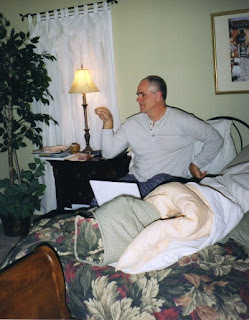 It loops sweetly through my memory of a very funny, patient, and wise father. Who over the years has made me laugh until I hurt, cried until I laughed, by sweet things he has done for me over the years, and has counseled, encouraged, and disciplined me anytime I have needed it. It is the story of my own father. He remains my hero and one of my very best friends. And I cherish the memories I have to be recalled anytime I need a smile, or an embrace from my sweet daddy! 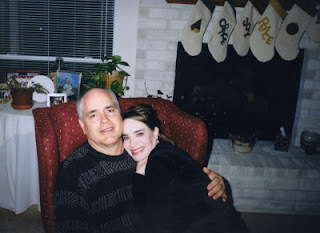 My daddy and I at a Christmas party at my parents house a few years ago. Seriously, I knew there was a reason I loved your Dad. Now I have to go blow my nose from crying and go to bed. Wow, it was a really smart woman who married this man. "Hey now, hey now, don't dream it's over ... "
OK, when I started reading this, your mother was in the room and I said, "Uh oh, I think Sarah wrote this to make me cry." So I hope that the lyrics above will make you sniffle a bit. I'm going to call you 10 times tomorrow so that song will play and make you miss CSI and Mr. Gatti's Pizza (and me). btw, you forgot "chocolate milk", "10 minute buns" and a few other choice moments. Hmmm .. I may start my own blog. Bella needs to do something funny ... I don't think I can take too much more of this. Okay, if your post didn't make me all sniffy your dad's comments did!!! What a great family you have! !